In Italy, people enjoy every moment of life. The pace of everyday living is much different than life in America. This style of life, encompassing good wine and authentic Italian cuisine is what Italy is known for. For the last 10 years Giorgio Pierangeli, Mario and Raffaele Sabatini, two brothers from the region of Abruzzi, Italy have brought their passions of providing the finest authentic Italian cuisine for the Brentwood area in West, Los Angeles. Executive Chef Raffaele graduated from Culina Institute of Villa Sion Mane and was part of the team at the venerable Cipriani in Venice. He has worked in some of the elite hotels, three of which are Grand Hotel, Relaisa Le Jardin, and Majestic Hotel. Pecorino Bistro has a cozy feeling, where patrons are surrounded by brick walls that look upon an open kitchen. The modern italian cuisine, which includes authentic dishes from various regions of Italy are available in a complete menu. 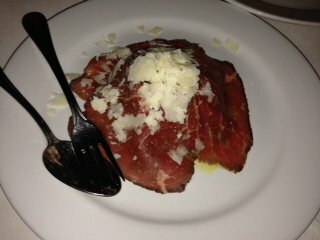 Pecorino Bistro is the kind of place that has many returned customers who have become part of the family. That brings us to our dining journey. My guest, Tom Hallick, an actor noted from his role as Brad Garret on “The Young and Restless,” and his wife, Yin Jiang, a concert violinist with Andrea Bochelli joined me on this festive occasion. When we arrived, it was a hustle bustle atmosphere, with a packed house. While we were waiting, a glass of Italian champagne was served to each one of us and a plate of horderves. Those hors d’oeuvres practically melted in your mouth. 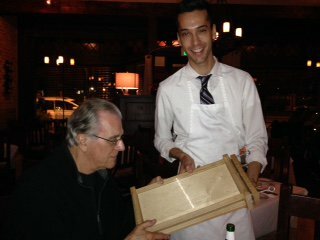 Shortly after, we met Mario Sabatini and learned that he single handily learned the business of providing authentic Italian cuisine starting as a dishwasher, then waiter, progressing to cooking. He learned every facet of becoming a raconteur. That is when he had his brother, Raffaele Sabatini relocated from Italy to Los Angeles. Today, Pecorino Italian Bistro is noted as one of the most popular bistros in Southern, California. Pecorino, incidentally was created from the cheese made of sheep’s milk. It is Italy’s most popular cheese. Here’s why this restaurant is so successful, where everyone becomes part of the family. First and foremost, all the cuisine is cooked fresh and all the vegetables, poultry, and seafood are delivered on a daily basis. Secondly, the recipes are authentic and prepared from recipes created during the inception of Italy. Thirdly, the staff enjoy what they do and show that they have a passion for it. Fourth, the service is at your fingertips. Nothing is left to wait for. What more can one ask for when dining with the family. The flavors of an enticing dining experience began with Caprino, warm goat cheese “Crouton,” served with seasonal greens with hazelnuts. We were then served Fava e ciconta, a soup prepared with Fava bean puree with sauteed chicory. I could see Tom Hallick closing his eyes and savoring every spoonful of the soup. 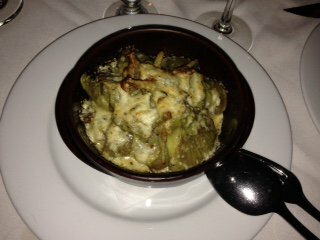 Our main entrees included Lamb Casserole, a deboned lamb with pecorino cheese and artichokes. This is Chef Raffaele’s hometown dish. I enjoyed the Branzini, a whole de-boned Mediterranean Seabass, served on parchment paper with porcini mushrooms and braised artichokes. This was surely delightful. Other entrees included Acconelle integrali, a homemade whole wheat flat pasta in a light extra virgin olive oil and basil sauce with cherry tomatoes and mixed vegetables. By now you would think we were filled to our tummies. Not so. We ordered Spinach and Ricotta cheese ravioli, prepared with fresh ripe and roasted tomatoes pureed with basil and we ordered Cacio e pepe, which is Spaghetti prepared with pecorino cheese, black pepper and extra virgin olive oil. 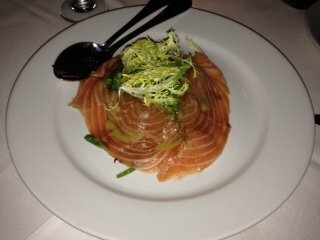 “That is gourmet dining, the best I have had,” stated Tom Hallick. Our dining journey ended with Tiramisu, prepared with amaretto liqueur. Yes, it had the muscatel as one of the main ingredients. 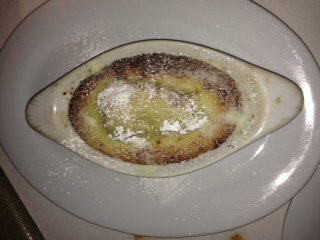 We also enjoyed the Pear au gardin with almond cream and a Chocolate mint. Pecorino Italian Bistro is located in Brentwood on 11604 San Vicente Blvd. Reservations are suggested by calling 310-571-3800. Hours of operation are Monday-Thursday 11:30-2:30 and 5:30-11 pm, 11:30-2:30 and 5:30-11 on Friday and Saturday, and 5:30-10 pm on Sunday. Celebrity Scene News awards 5 stars to Pecorino Italian Bistro.